dents of 2017 were leaving in preparation of the exams, Savannah, Mayank, Chiara and Alessandro took upon themselves the responsibility to continue Saturday classes with the young children. This was the perfect opportunity for us to challenge ourselves in an area that all of us are passionate about. 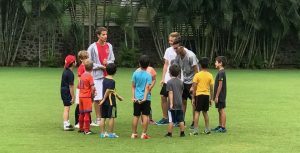 main aim was to get to know the kids and slowly start planning the sessions that will help them to improve their game. At the same time, we had to make sure that the kids were enjoying the sessions. Through planning every week and collaborating together as a team, we ensured a smooth transition from our seniors who lead these coaching sessions in the previous year. Slowly and steadily we were getting better at planning, organizing, and conducting the sessions. This gave us the confidence to organize a small parents and kids tournament at the end of the last academic year. This was the perfect way to end the year and also to say goodbye to the kids who were leaving the school. Following a really good start we continued these sessions in the new academic year. 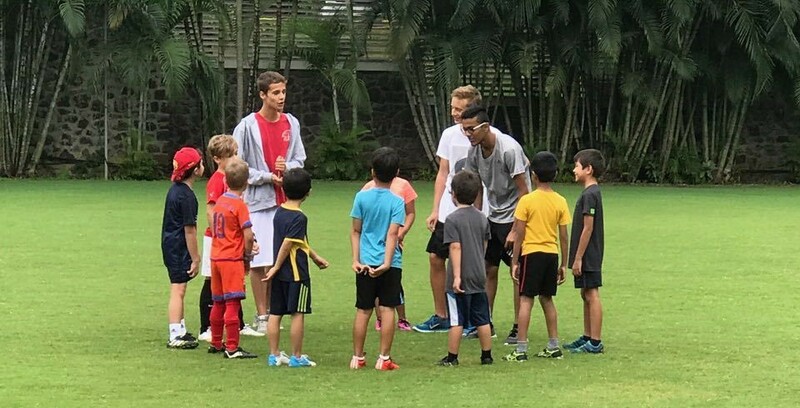 We wanted more kids to participate in these sessions so with the help of Ms. Jodi, Ms. Carla and Ms. Helen we promoted the Saturday football coaching among the PYP kids in the first few weeks of the new academic year. This resulted in a huge number of new kids signing up for these sessions. As much as we were looking forward to this, we knew that this was going to be really challenging task. In the first few sessions we had to adapt and plan accordingly. In order to make these sessions of the highest quality each of us had to contribute and take up different responsibilities. oaches had to leave the project for other responsibilities. 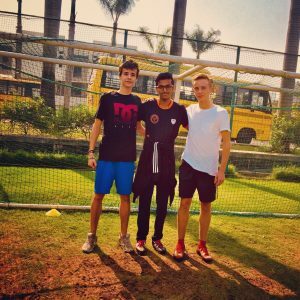 From the original group of coaches, Zain, Arjun and Lorenzo left in March of 2017. That was when Alessandro, Mayank, Chiara and Savannah joined. Towards the end of her DP1 school year, Chiara left, to take up other CAS activities. Savannah had to leave at the end of DP2 Semester one to pursue other sports, however Maciej, from MYP5, had already joined the group. The remaining student coaches, continued to take care of the growing number of kids, since there was always somebody joining in. We were all responsible for the care and well-being of all our football players and if one got injured, it was a challenge to bring them to the nurse while making make sure that the others are not left alone. ve fun. This tournament was a test for us to see if the kids had actually improved or not. We could clearly see that the kids had improved their game. We could see all the drills that we use to carry out on a weekly basis were being applied by the kids in match situations. We saw a real competitiveness showed by all the players and we could see that none of the teams wanted to lose and were fighting till the last minute of each match to ensure victory. All of us were very satisfied with this as we were able to build a balanced winning mentality, which is really important going ahead. As a team and as individuals, we gained a lot of skills through this experience. There is no doubt that this experience is going to help us in the future. The collaborative skills, leadership skills, the challenges that we faced and overcame as a team really made this experience a special and memorable one. We would like to thank Ms. Jodi, Ms. Carla and Ms. Helen for helping us to make these sessions of the highest quality.